Burying overhead lines near the cliffs cited as important for both visual and safety reasons. Longstanding efforts to bury the power lines at Aquinnah Circle have reached a milestone, with Eversource Energy agreeing to do nearly all of the work for a fraction of what the town had expected to pay. The utility company has offered to bury all but one of the existing power lines, starting just south of the Gay Head Light, for $135,000. It has also done preliminary engineering at no cost to the town. “For the first time, we actually know how much it’s going to cost, and we actually know how it would be built,” community preservation committee chairman Derrill Bazzy told the selectmen this week. He called the price “reasonable and achievable,” although it will depend on fundraising. Mr. Bazzy said Eversource typically quotes line-burial projects at around $2 million per mile, making the cost of the project at Aquinnah Circle about a third of what might be expected. The project would span about 0.2 miles. A stretch of secondary power lines at the bottom of the Circle were buried in 2009. A plan to bury all of the lines resurfaced during the Gay Head Light relocation project, completed in May. Design surveys by Eversource call for removing four poles and placing transformers along the road. A light pole near the lighthouse property would remain. The town would handle all of the environmental permitting, along with the burial of a town-owned line that connects to Faith’s Seafood Shack at the entrance to the Aquinnah Shops. Mr. Bazzy believes burying the line will cost about $5,000. Funding could come from the community preservation committee and the state, Mr. Bazzy said, including a program that former Gov. Deval Patrick set up for storm protection and infrastructure development in coastal communities. Among other things, he said burying the lines would lower the risk of wind damage in the exposed cliff area and improve safety at a town- designated heliport at the Circle. Burying the lines would open up opportunities for pedestrian paths and bus access, as discussed following the lighthouse relocation. New solar panels at the Circle could help power the lighthouse and sell energy back to the grid. “That would be a really nice package to bring up to the statehouse, of burying the wires and providing solar power to offset the lighthouse use,” Mr. Bazzy said. The selectmen approved the plan by consensus, and supported the CPC in taking the next steps. Selectman Spencer Booker suggested forming a separate fundraising committee, as was done to support the lighthouse relocation. Planning will likely continue over the next year. The project would require town meeting approval, which could further strengthen the town’s case for state funding. Mr. Bazzy plans to meet with Rep. Tim Madden and Sen. Dan Wolf to get a better sense of what funding might be available. In other business at the meeting Tuesday, selectmen approved a plan by Phoenix Communications to install underground wires and small poles for about a half mile along Lighthouse Road. Residents had complained about the aesthetics of an earlier proposal to install a distributed antenna system (DAS), which relies on a series of poles as an alternative to a single cell tower. The revised system will couple the smaller poles with existing poles along the road to help preserve views. Three shop owners also came to the selectmen with concerns about the lack of late-season tour bus service to Aquinnah Circle, which they called an annual problem. “Ultimately it is affecting all the businesses on the Island,” said Berta Welch, owner of Stony Creek gifts, who appeared with her sisters Carla Cuch, co-owner of Stony Creek, and Adriana Ignacio, owner of On the Cliffs. Faith’s Seafood Shack has been closed for two years, and Dreamcatcher closed for the season on August 30, raising concerns this summer that the tour stops in Aquinnah would end early again. Selectman Juli Vanderhoop said she had been unable to contact Scott Dario, owner of Martha’s Vineyard Sightseeing, which runs tours to the Circle during the summer. The selectmen agreed to bring the issue to the next meeting of the all-Island board of selectmen. 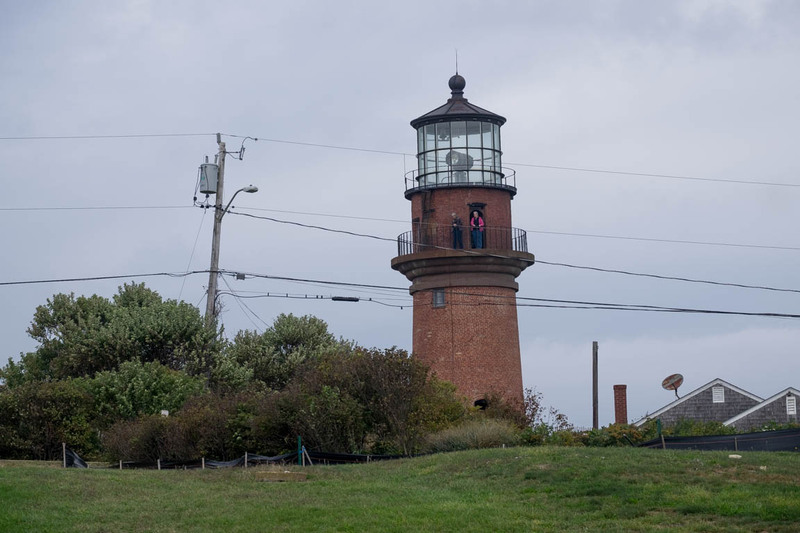 The town has been working to establish a cultural district that would include Aquinnah Circle, along with the Gay Head Light and Moshup Beach. The designation would open the door to funding and tourism opportunities through the Massachusetts Office of Travel and Tourism.